The accompaniment to Whole Roasted Duck Stuffed With Chestnuts. Recipe courtesy of Chef David Myers, Sona, Los Angeles, California. 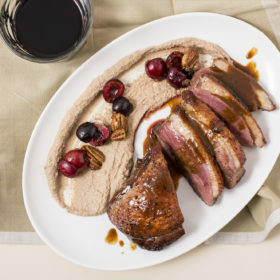 Persimmon Chutney is the perfect accompaniment for Whole Roasted Duck Stuffed with Chestnuts. 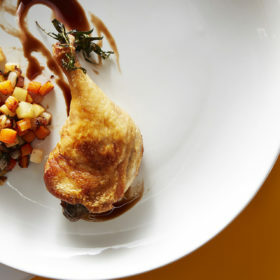 For the full recipe, check out the December 15 issue of Wine Enthusiast Magazine. Peel the persimmons and roughly chop the flesh. In a sauce pot, sweat shallots in olive oil until clear. Add chopped persimmons, cinnamon, cardamom and honey. Cook on low heat for 30 minutes until thick and flavors have melded. Add salt and pepper, to taste. Place in a serving vessel and garnish with fresh mint leaves.